Who isn’t familiar with them? The wonderful quotes of Pooh, Piglet and Eeyore from the ‘Winnie the Pooh’ stories? All of these brilliant oneliners are the work of A. A. Milne; one of the most talented writers in history. And seeing as he wrote one of my fave quotes of all time, I decided to honour him with a piece of artwork. 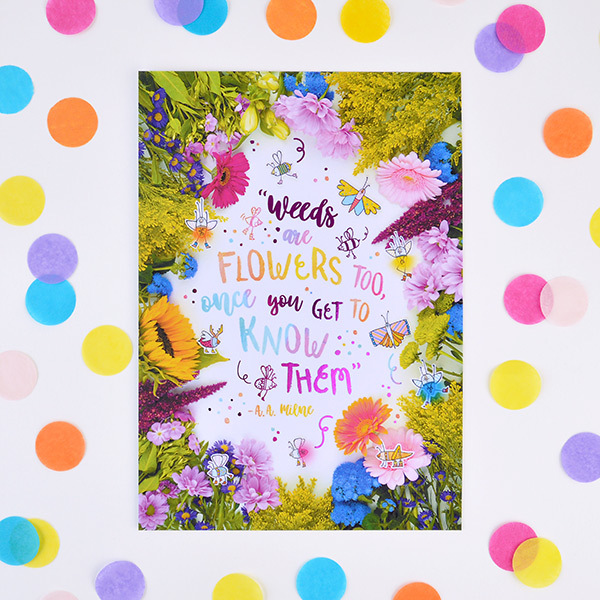 This ode is a new mini print featuring my favourite quote by him: ‘Weeds are flowers too, once you get to know them’. The design might look familiar, as it is the same design I used for my notepad last year. 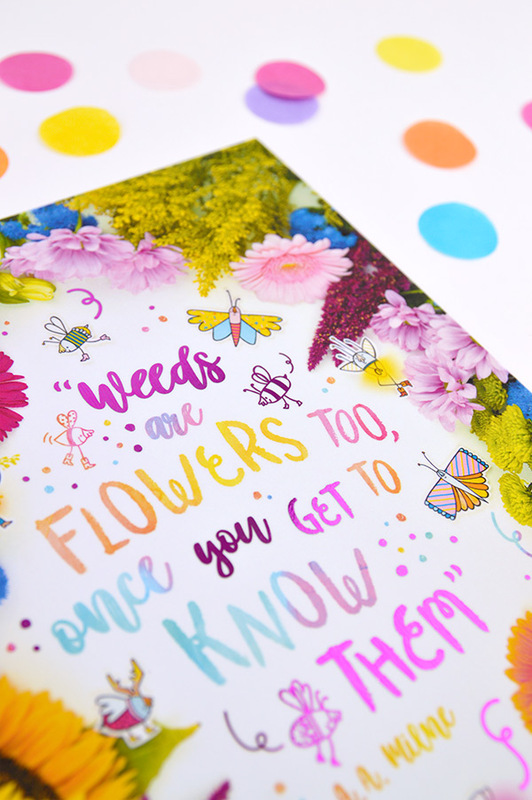 I designed the typography of the quote especially for this new design. This quote is brilliant in all its simplicity. It is also a reminder that we are usually very quick to judge, which isn’t always good. So let’s just get to know one another before judging them. This art print measures 14,8 cm by 21 cm (5,8 inch by 8,3 inch). 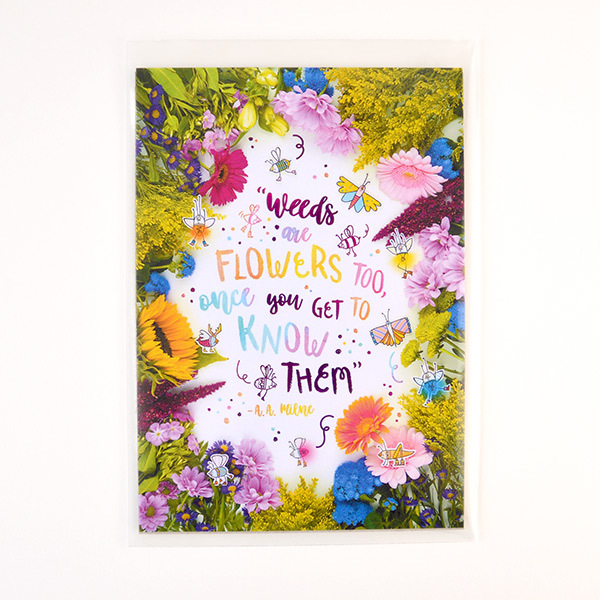 It is printed on heavy cardboard and has a matte varnish and hot pink/purple foil details on the front. Each print is individually packaged in a plastic wrapper with a cardboard backing. It is now available in my Etsy shop. And for the real Milne fans I have a tip to share: The movie Christopher Robin is now in theatres and it is an absolute must if you’re into the melancholy of his stories. Add the brilliant character design by Disney and you have the most lovable movie of the year. 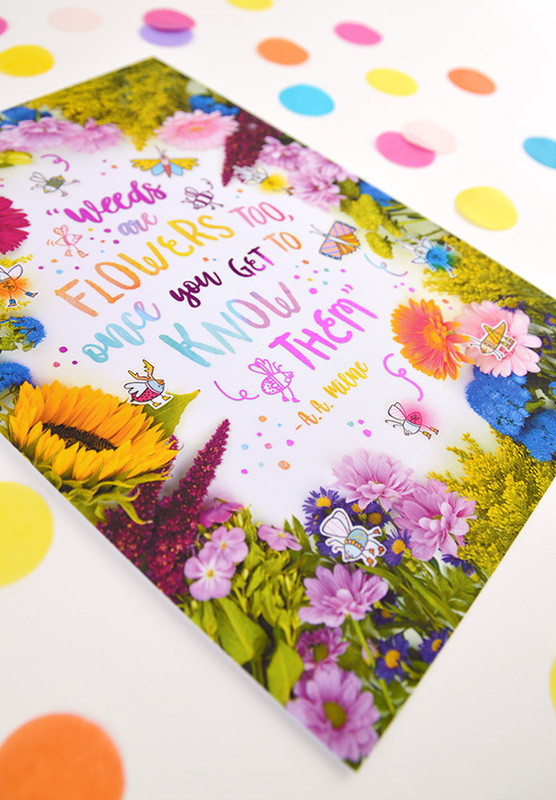 Do you have a favourite quote (doesn’t have to be by Milne)? Let me know in the comments!